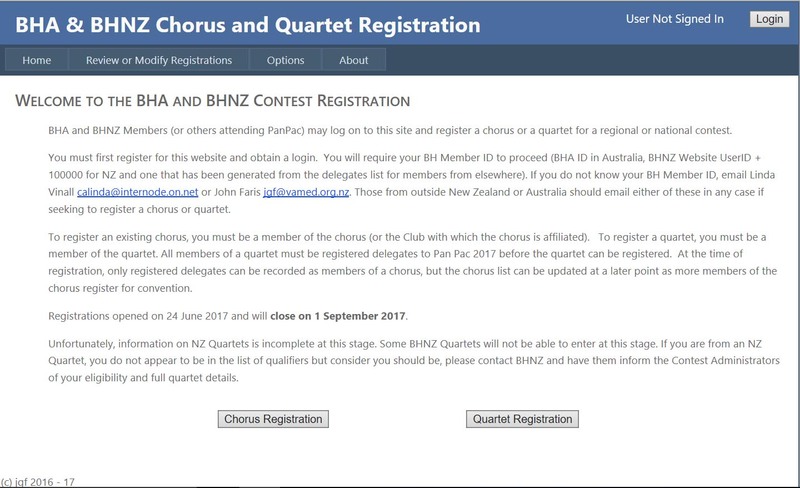 Note that the person selected to register a Chorus MUST be a current financial member of the BHA or BHNZ, MUST be a member of the Chorus and the Chorus MUST be currently registered with BHA or BHNZ. 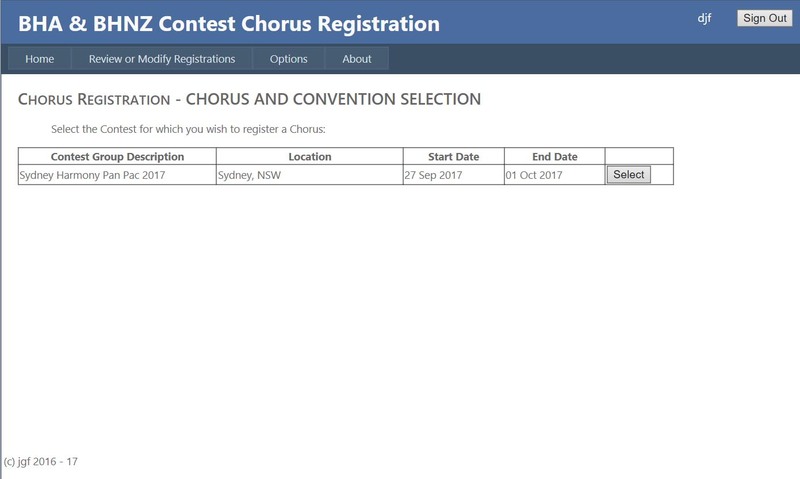 For international choruses,the Contest Administrator will ensure the Chorus meets the equivalent requirements on request. To register a chorus, click on the Chorus Registration button. You will first be asked to confirm your email address and mobile phone number. The email address should be (but does not need to be) the same as in the BHA or BHNZ database (or for internatoinal delegates, the email address you used to register for convention). If the email addresses are NOT the same, you may have difficulty if you lose your username and need to recover it. (The form is the eseentially the same for both Quartets - as show here - and Choruses). The mobile (or cellphone) number should be one available at convention as the Contest Administrator may send text messages about your contest entry. You can update the email address or mobile number and click Update. If they are (now) correct, click on Continue and you will come to a screen showing any contest groups for which registration is possible. 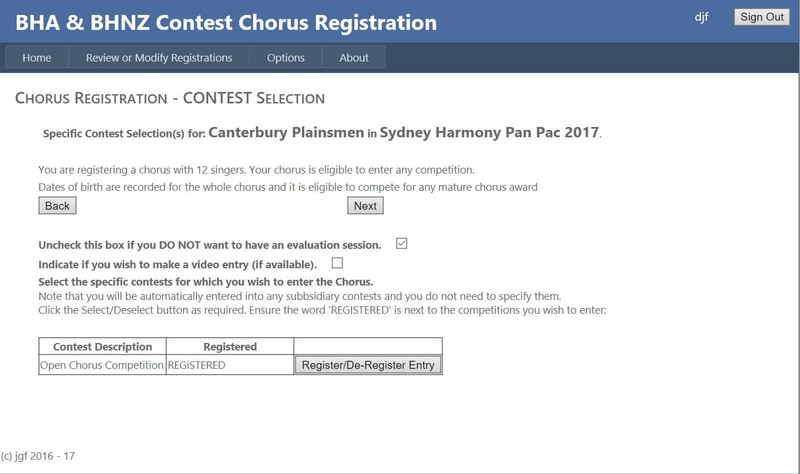 The Pan Pac 2017 contest, for example, is considered a "contest group" as it comprises both a Chorus and a Quartet competition and within each of these might be Open Chorus, Mixed Chorus, Open Quartet, Senior Quartet and Youth Quartet competitions, etc..
Click on the Select button which will highlight the contest and show you the names of any choruses in which you are recorded as a member. Click on the Select button for the Contest Group in which you want to register the Chorus. Doing so will give you a chorus or list of choruses you might wish to register based on the membership of choruses as recorded by BHA or BHNZ. Note that, as in this example, the initial data on the BHNZ Choruses does not include the name of the Music Director(s). The opportunity to name them occurs at later time. Click on the Select button in the row with the Chorus you wish to register. Note that contests are grouped together if they take place together, eg in the example above, the open and mixed choruses are run together have been styled “All Choruses Competition”. If there were, for example, a separate Youth competition, this would be listed separately with its own “Select” button. A youth group also wanting to enter the open competition would be required to register separately for each. There will be an opportunity for the specific contests to be selected a little later. In other contests, there might be a separate Youth Chorus Competition. A Youth Chorus might want to enter both the Youth and the Open competitions. 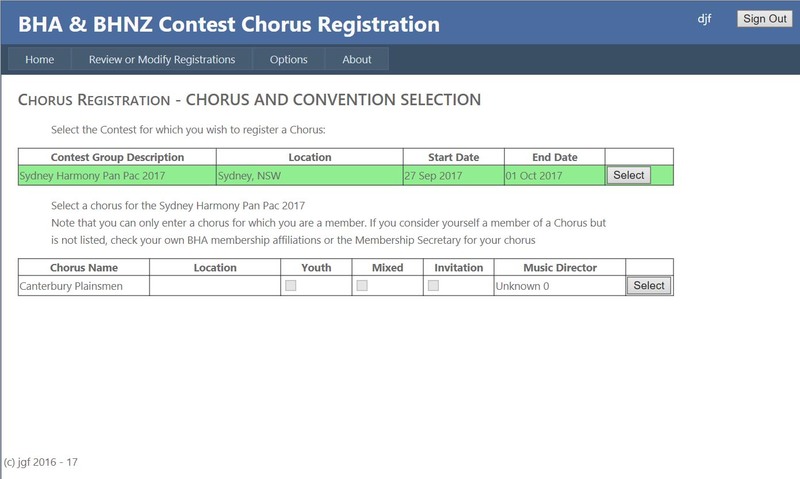 In this case, it would be necessary to register in the All Choruses competition selecting Open Chorus competition in a later screen and then putting in a completely new registration selecting Youth Chorus at this stage and confirming Youth Chorus when the specific contests are selected in the later screen. After selecting the contests, you will be taken to a screen where you need to confirm the members of the Chorus. The screen gives you the list of members in the Chorus. 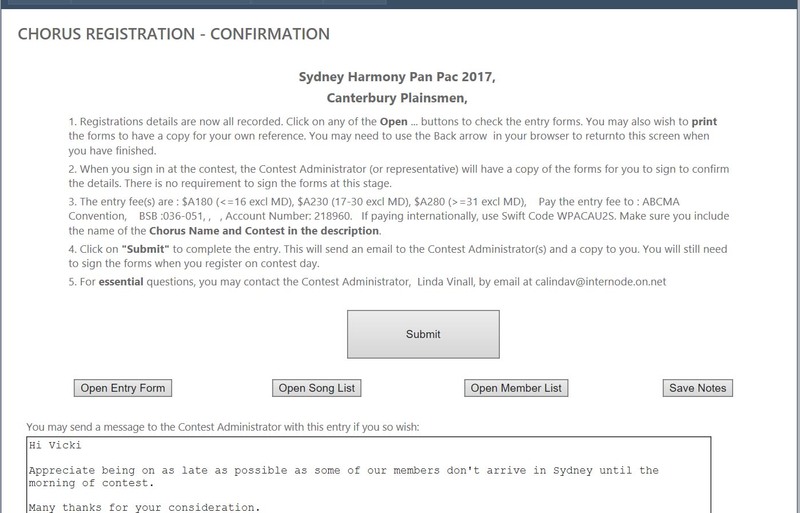 If the contest has the requirements that all performers are registered delegates, this will be shown alongside the performers name. 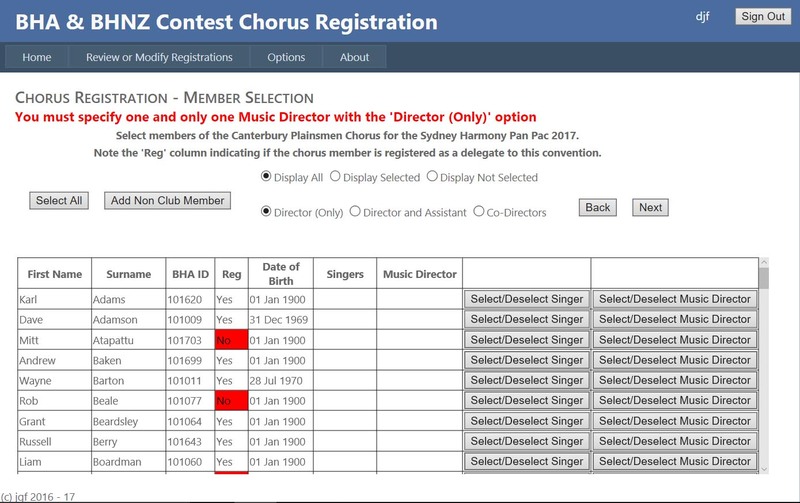 As this is a BHNZ Chorus, the Music Director has to be selected manually and a warning will be given, as shown, that the Music Director needs to be selected. You can click on Select/Deselect Singer to change the member from singer (shown as SELECTED) to non-singer (shown as a blank). Clicking on the Select/Deselect Music Director button has a similar effect. For Singers, you can Click on Select All to select all members of th chorus. Note, howevever, that if the contest requires all performers to be a registered delegate, clicking on any of these buttons will have no effect on performers who are not yet recorded as delegates. There is the option to have a Music Director (Only), a Music Director and an Assistant Music Director, or two Co-Directors. Click on the appropriate radio button to select which option applies to your chorus. If there is a Director and an Assistant, repeated clicking on Select/Deselect Music Director will cycle through Assistant MD, Music Director and Singer. On the left is the list of members of the chorus. On the right is the BHA and BHNZ membership list. You need to find the particular member you wish to add to your chorus and when you have done so, click on the Add to Chorus button. When you have finished with the screen showing the membership, click on the Select Members button to return the main membership selection screen. Note that having added a member to your chorus, the Select/Deselect Singer or Music Director buttons will work with the ring-in member as they do for an ordinary member of your club. If you are trying to add a BHA or BHNZ member to your chorus, you can make the search for the person faster by typing a partial surname, partial firstname or a BHA or BHNZ member ID in the search box above the BHA membership and clicking on the Search button. Look for the BHA or BHNZ member you want and click Add to Chorus as described above. 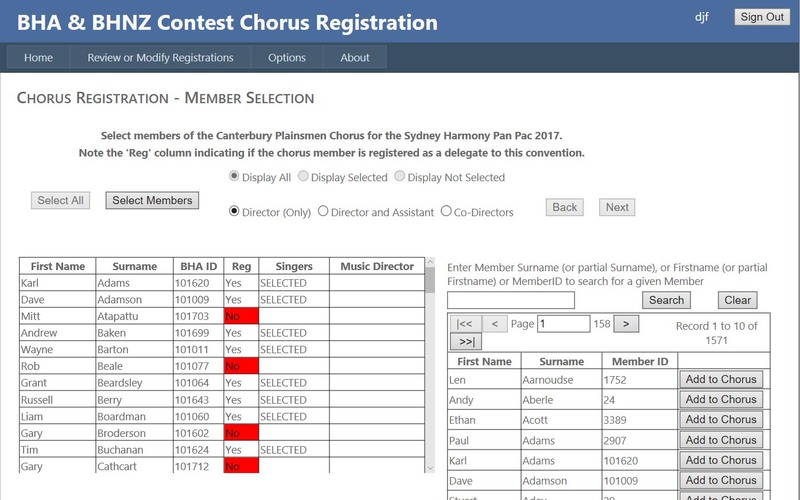 You will note that in this example, Open and Mixed Chorus competitions were mentioned on a previous screen, but the system now only offers the Open Chorus as an option (as a Chorus can not be both Open and Mixed). Click on the Register/DeRegister button to register or de-register the Chorus from the competition(s) that have been offered. 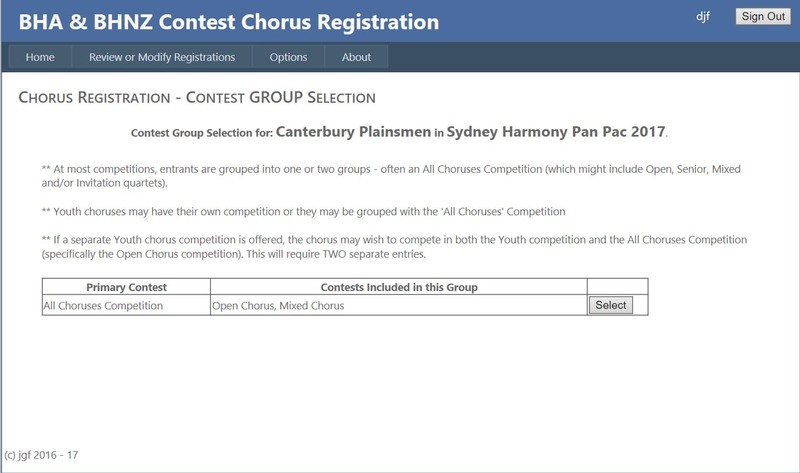 In this example, Plainsmen have been registered in the Open Chorus Competition. You should also tick the check boxes for requesting an evaluation or a video entry as required. The evaluation check box is ticked by default. (Note that video entries are not accepted for all contests even though the website might offer thiis option). An invitation Chorus might be offered both a two song or a three song invitation. If a Youth Chorus competition is being offered as a part of a Chorus competition, both Open and Youth should be offered If the right contests are not being offered, your chorus may not be correctly registered with the BHA or BHNZ. 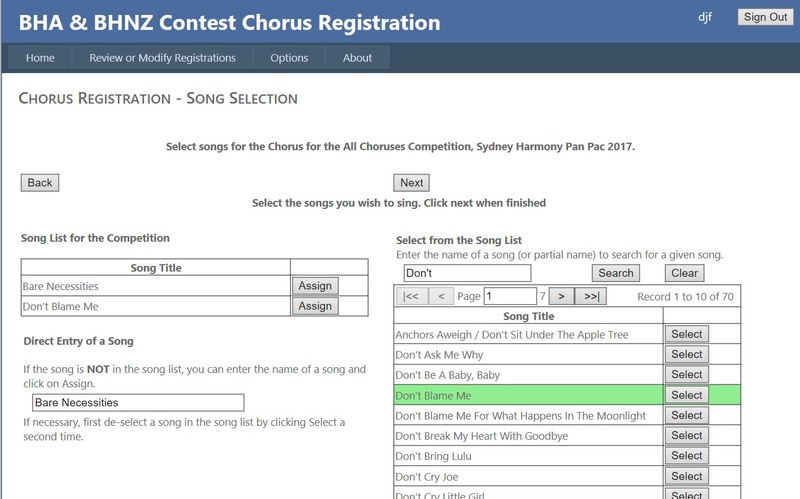 If you consider your Chorus should have been offered a competition but it is not shown on the screen, it is likely the Chorus is not registered correctly with BHA or BHNZ. So the first action is to check the BHA or BHNZ registration. Continue with the registration but contact the Contest Adminstrator and plead the case for entry in the missing competition - the Contest Administrator has the ability to override the BHA registration. Find the song in the list of songs on the right of the screen. You may enter a partial song name in the search box above the list of songs and then clicking Search. In this case, "Don't" has been entered in the search box and the song list now shows all the songs in the list with the word "Don't" somewhere in the name. Click on Select against the particular "Don't" song you want. Wait for the line to turn green, then click on the assign button against one of the songs in your song list on the top right of the screen. If the song you wish to sing is not in the song list, you can enter the name directly in the box at the bottom left of the screen. Then click on Assign against the Chorus song list. In this example, the former method was used for the first song and the latter for the second. Click on “Next” to complete the Registration. Please read the fine print on this screen! You may preview your entry by clicking on “Open Entry Form” or “Open Song List”. The members of the quartet are listed on the entry form itself). You may also type in a note to the Contest Administrator (as has been done in this example). Having done so, click on Save Notes to do so. The note will be included in the email sent to both you and the Contest Administrator. Reference to the note will also be included on the entry form. When you are happy with the entry, click on the “Submit” button. This will email the entry forms to the Contest Administrator(s) with a copy of the email going to you. NOTE – the Contest Administrator will have copies of the entry forms available at the registration desk when you report for the contest. You will need to sign the forms at this point. There is no requirement to post the forms before contest. You may also note that prior to submitting the entry, you may halt the process and come back to it. However, once one person has started the registration process, another person cannot take it over (without emailing the Contest Administrator and asking them to allow it). After a registration has been completed, you can review it by clicking on “Modify or Review Registrations” on the menu bar. You can only modify the song list for a quartet. 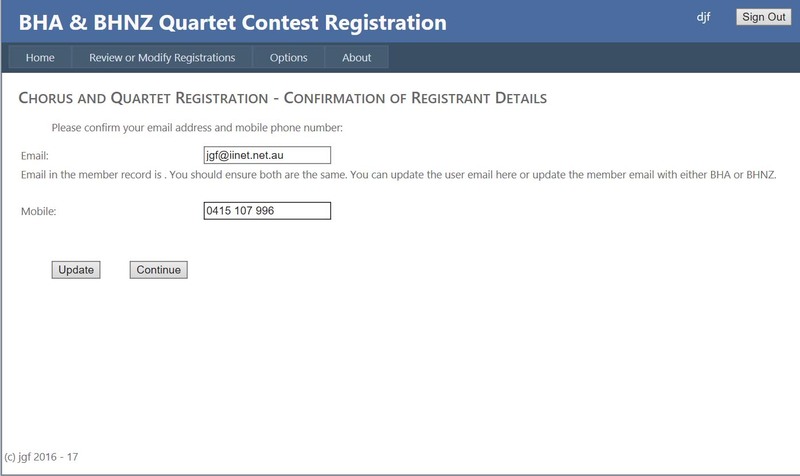 To change the contests in which the quartet is registered, you will need to contact the Contest Administrator.